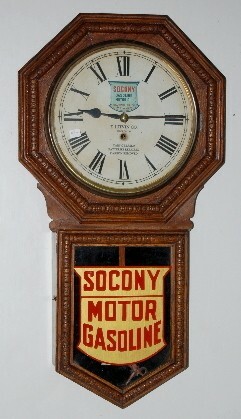 Waterbury Oak "Heron" Advertising Wall Clock has pendulum and key; 12" paper dial advertising "Socony Gasoline Motor Oil, E. Litvin Co., Cars Greased; Batteries Repaired; Carbon Removal" TO; nice advertising stencil on lower door, age of stencil unknown. Not tested. 32 1/2"